Reading this book is like reading a book on current events in the United States even though it was written over 150 years ago about France. 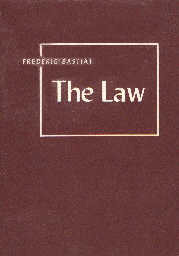 Law, according to Bastiat "is the collective organization of the individual right to lawful defence." It exists only to do what individuals have a right to do: protect their persons, their liberties and their properties. When the law is used for more than these three goals, the law becomes an instrument of injustice. Plunder is easier than labor and can easily become a tool of those who make the laws to make life easier for them. When law uses plunder, all classes of people attempt to enter into the making of laws to get their piece of the pie. When the 1992 politicos begin talking about fair taxes, we can recognize that they are encouraging their constituents to support the plundering of some other class for their benefit. Bastiat points out that "protectionism, socialism, and communism are but one plant in different stages of growth." The 1992 world finds the seventy year growth of communism in the Soviet Union has proven that the last stage of growth of that plant is catastrophic ruin. Given that fact, it is amazing that the other two stages are flourishing in the United States, socialized medicine given credence as planks in national platforms, and protectionism flashed on bumper stickers on union workers' pickup trucks. Socialism flourishes in the United States under the politically correct names of mandates, entitlements, food stamps, welfare, unemployment insurance, medicare, aid to dependent children, veterans benefits, etc. Each congressional session passes numerous bills to plunder one more group to help some other group. Both groups are hurt in the long run, but in the short run, the Democrats in Congress get re-elected. Bastiat is especially forceful in his attack on the premise of socialist writers of his time that the common man must be motivated and lead by laws passed by legislators that are not prone to the same foibles as those they represent. Bastiat says, what give him the right to say his utopia is better than my utopia? This book should be required reading for every lawyer upon passing the bar and before becoming an elected representative of the people.